Lisa T's World: Look what Jessica did!!! Nancy's Notions has done it again - suckered another person into the wonderful world of quilting! Jessica saw this totally cute quilt on their site and thought she was buying a quilt top! When the package arrived with lots of pieces of fabric and Nancy's 'broad' assembly instructions, she almost sent it back, but the fabrics were just too cute!!!! Now, what to do. . . Jessica found me on the internet and we were off on a quilting adventure!! I was honored last night by getting to help Jessica learn to quilt! This was the first sewing she had done since sewing a body pillow in Home Ec in High School! This is her first 1/4 inch seam!!!! Yea!!!! She has a better 1/4 inch seam that most of my other students! She is consistant and has a beautiful seam from start to finish!!! The coolest thing is she is not afraid of the machine. She even cut out fabric pieces with the rotary cutter!!!! We cut out pieces - and boy does this quilt have pieces - and got the center focus panel sewed together. We fussy cut out the blocks with the cute animals and then sewed the green sashing between them. This is just too cute!!! The words around the animals read "What do you see"? 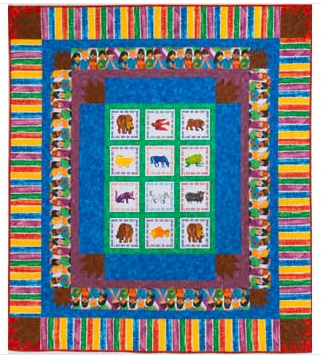 This quilt is for a baby that will be born at the end of March. We also talked about in a couple years, going back and adding fur to the bear and maybe feathers to the bird and scales to the fish; there is a chance that the baby will have vision issues, but that won't be know for awhile. Oh, yeah, I didn't mention that Jessica has vision issues. She brought along this cool machine that can enlarge the area that she is working on. We still have to tweek the use of this machine to get the best picture of what she is doing but we are gonna work on that. Mostly, Jessica made her beautiful 1/4 inch seam by 'feeling' her way along the pressure foot. We added and big piece of masking tape to the machine bed so it would be easier to line up the fabric with the presser foot. Jessica thinks she needs to try to teach Pippin, her guide dog, to help facilitate in her sewing ventures. Maybe he could 'hand' her the squares and then the rectangles. Would be really nice if we could teach him to iron! I'm thinkin' picking up the threads may be his lit in life. . . The possiblities are endless though!! We will be meeting again tonight, so stayed tuned for her progress!!!! Tonight - half square triangles and the bear paw block!!!!!! Jessica attacks The Bear Paw block! And the story begins. . .
Maybe I'm not crazy. Maybe I'm just stupid!! !